Okay, so I sliced off a chunk of thumb and finger at work yesterday.. Nice.. Miss Holly and I went and searched for the chunk, found it and threw it out. Nasty. So, I'm all bandaged up. You don't realise how much you use your non-dominant thumb until it hurts like hell..
ANYWAYS, here's a sketch. Cheers. Man, Ash, I am loving this stuff. Especially the painting of the Merrow, and this most recent sketch - and even more impressive considering you drew it with your messed up thumb (how's that healing, by the eway?). Does she have two tails, though? Or is one of those from something else? She does in fact have to tails. Melusines were often depicted with one or two tails in either fish or serpent. Sometimes with dragon wings too, as they are shapeshifters and can shift into dragons. Oh, and crowns too. 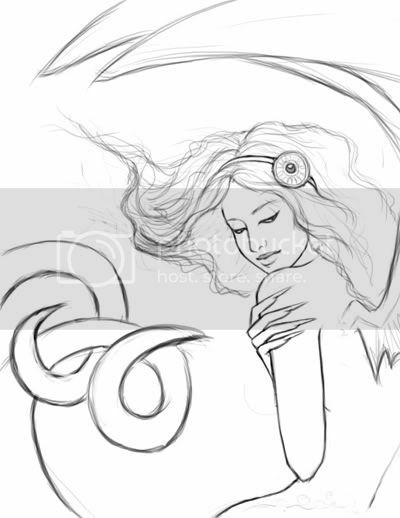 The Starbucks logo is a Melusine in reality, but they often mislable her as a Siren, which is totally different. Thanks Arthur. My thumb is doing much better, still hurts and looks gross, but polysporin is amazing stuff. Have a great weekend!